Sheikh Allauddin son of Sheikh Rafi-ud-Din was born on August 1, 1947 at Gharonda, District Karnal, East Punjab, India. 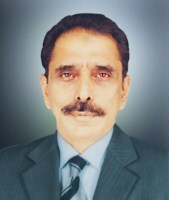 He obtained the degree of MA (Political Science) in 1970 from University of the Punjab, Lahore. A businessman and a landlord, who remained Member, Provincial Assembly of the Punjab during 2005-07, 2008-13 and 2013-18 and has returned for the fourth consecutive term to the Punjab Assembly in general elections 2018. Hehas functioned as Minister for Industries, Commerce and Investment during 2013-18. He has also served as Chairman, Punjab Land Development Company. He has visited USA, UK, KSA, South Africa, Australia, Morocco and Bali. Toyota Ravi, 37 Main Jail Road, Lahore.